Pepperell Drop Zone is a very social place. They have hundreds of dives every day, so there are always plenty of people there. Since there is a wait between each plane that goes up, people tend to hang around together and talk. It’s an enjoyable atmosphere. One thing I find interesting is that many of the jumpmasters live at the airport. The majority of them move to Florida for the winter, but during the spring, summer, and fall, they live in trailers behind the hanger. It’s a very friendly, comfortable place. Here are some facts about freefall. In the stable arch position you reach terminal velocity in about 9-10 seconds. The arch position has a terminal velocity of around 110-120MPH. So, in the arch position, at terminal velocity, you will fall 1,000′ every 5-6 seconds! A 9,000′ freefall takes 55-61 seconds. 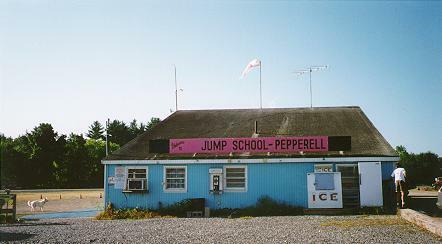 A 10,000′ freefall takes 60-67 seconds. An extra 1,000′ really doesn’t add too much time. Student parachutes travel at a forward air speed of 15MPH when the brakes are not applied. So, students are therefore not allowed to jump when the winds are higher than 14MPH. Experienced people usually use smaller chutes. Many use chutes that travel as fast as 40MPH! Naturally, they are not as restricted, but still do have their limits. …I remember seeing that info [about the world record] in the “Sport Parachuting” basic handbook by Russell A. Gunby 1963 edition. The Pioneers in Pararchuting section lists: Capt. Joeseph W. Kittinger, Jr., USAF as the record holder. He used a ballute for stabilization. He also carried 30 to 40 pounds of instruments to record weather, etc. There is no memtion of the two previous jumps he made from 75,000. The first one almost killed him when he was unable to stabilize in the rarified atmosphere and spun out of control resulting in a RED OUT. His automatic opening saved his life that time. On his next jump, he moved his arms and legs in circles to simulate a gyro and it worked. Because of the duration and temperatures of the record jump a ballute was used. The temperature ranges from -50 (below zero F) at 50K to about ground temp at 75K and back down to subzero tempuratures again at 100K. Of course there was still the possibility of him passing out again. Several others have tried and failed resulting in death. One young man (unknown to me), I think from New Jersey, USA, using borrowed equipment, got to 115,200 but couldn’t dissconnect the oxygen lines due to icing and had to ride the gondola back to 10,000 where he bailed out. I believe he landed in the Chicago city dump on that try. Afterward, at a jump center in NJ, he was quoted as saying “–the next time I’m going to take two wrenches–“. The next time he made the attempt, his suit (faceplate) blew a seal at 56,000. His last words were “EMERGENCY! EMERgen—“. At that time he was cut loose from the balloon by his ground crew. He remained in a comma for two months and I’ve never heard if he survived or not. He had a wife and two kids. “Out of 10,000 feet of fall, always remember that the last half inch hurts the most. If you keep this in mind it will give you the necessary nonchalance for a successful jump”–Captain Charles W. Purell, 1932. Felix Baumgartner broke Joeseph Kittinger’s record on October 14, 2012 from an altitude of 128,000 feet (24 miles). During his 4 minute and 20 second freefall he reached a speed of 833 MPH. I particularly like that Kittinger was on the radio with Felix the whole time.